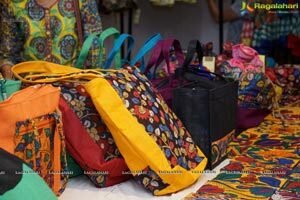 The Looms, the exclusive Kalamkari boutique, kick started a two day Kalamkari Festival where Kalamkari Luxury Collection is showcased. 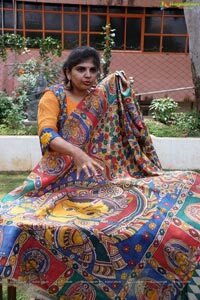 Kalamkari is a dieing art form and is on the journey of revival. 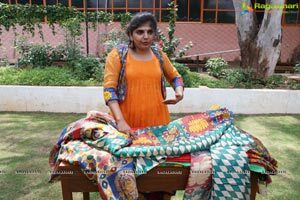 Sangeeta Rajesh, an academician turned fashion designer has put together this luxury exhbition of Kalamkari Sarees, Kurtis, Dupattas, Anarkalis, Skirts, Bouses, Dress Materials, Kalamkari Bags and Vanity Boxes. This being held today and tomorrow at Saptparni in Road No. 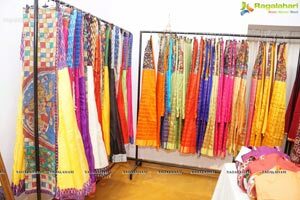 8, Banjara Hills, Lane Opp GVK Mall. 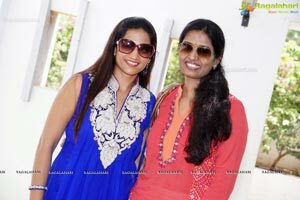 It is the 5th edition of the festival. 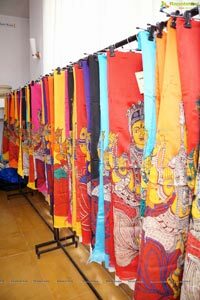 Each of the 250 sarees exhibited are assembled, uniquely designed and developed. 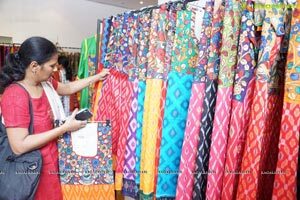 Each of the sarees displayed here had a long journey and passed through the hands of expert artisans and designers before they are showcased here, said Sangeeta Rajesh, an educationist turned fashion designer. 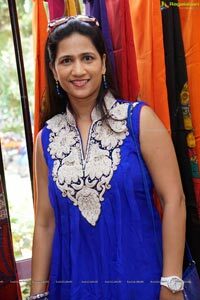 She is trained at ISB under Goldman Sachs 10,000 Women Entrepreneurs Certificate Programme. 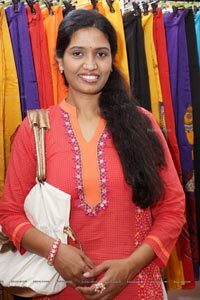 She worked in Euro Kids, Meridian School, DRS Kids, Educom Solutions and others. Sangeeta is a multi tasking woman. Her pre primary school, smiles today is know for Remedial Instruction, for special children, who are dropped due to various learning difficulties. 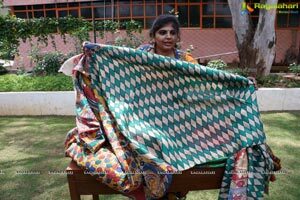 Each saree is a piece of art. 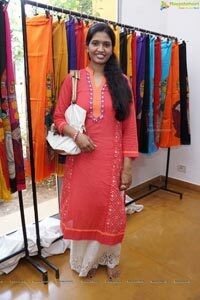 Sangeeta models for all the designers sarees she produces. Her facebook has 72000 followers. 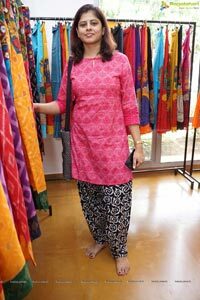 We have paintakinly curated each of these designed for the past six months, informed Sangeeta. 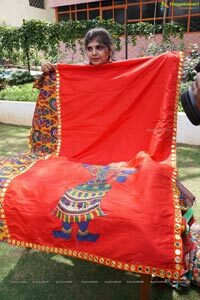 Kalamkari works are considered worth only for wall hangings. 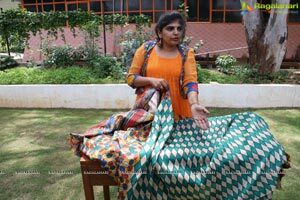 It is common peception that Kalamkari Sarees are only for elderly women. But, that should be changed. 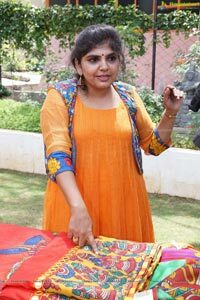 My aim is to make Kalamkari Sarees the most sought after so much so that they must not only appeal to young girls and but also must be preferred to wear for grand occasions like Weddings, said Sangeeta Rajesh. 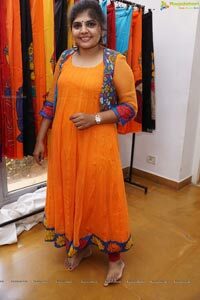 Fashion must appeal to common people, Sangeeta says. 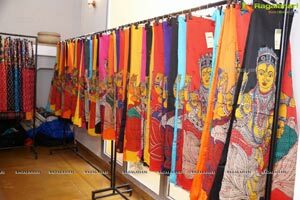 Some of the saree collections include: Kadam, Kathak, Abhinayam, Ramyam, Chanderi applique and Shadow Sarees. These are traditional, yet contemporary. 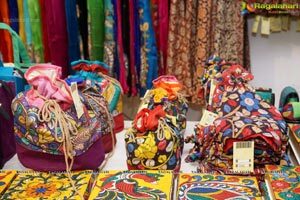 India is a land of rich textiles and ancient crafts that have constantly been revived over the years. 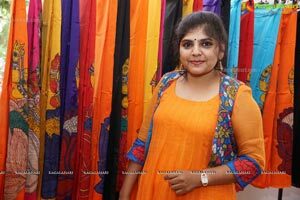 These are the sarees must to be owned, says Sangeeta. My inspiration for these designs are Madhura Meenakshi AmmanTemple, a historic Hindu temple; Indian Dance Abhinayas and Balambika Diety, a goddess of the Hindu religion. 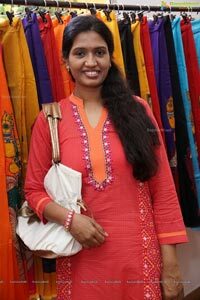 I am born and brought up in Temple town of Madhurai. 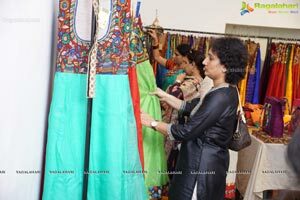 So i have that influence in my designs, said Sangeeta. Balambika with four arms and a red circle on each palm, holds what looks like a gold bar and a necklace with two of her arms. She is considered a child, and acts as one, but is said to bring true knowledge, education, wisdom, power and prosperity for a better life. She is sometimes called the goddess of children. I took her photograph to artists transferred it on the cloth. 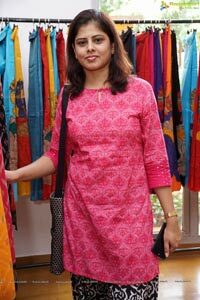 And thus produced Balambika Kurtis, she said. 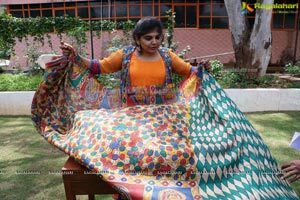 Another unique and interesting design is Abhinayam Saree portraying all the Abhinayas, dance forms nearly about 70 with one big pallu. 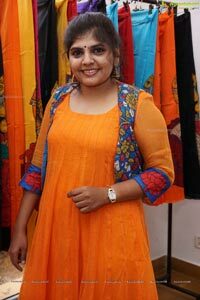 Kadambam Saree with floral patterns. 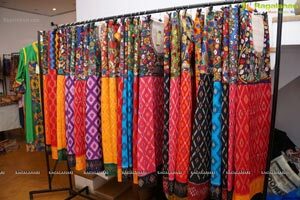 Kalasham girls are depicted in the borders of the sarees. Unique motifs for "Shadow" concept. 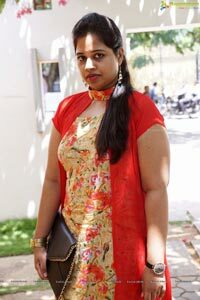 "SHADOW SAREE" with black and white combination, with traditional peacock flowers pattern cannot escape your attention. Big Gear Skirt another feather. It took 6 months to come out the kind of a pattern of skirt. 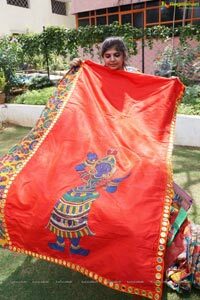 It consumed 8 meters of cloth and 40 days of two artisan"s work to complete it. 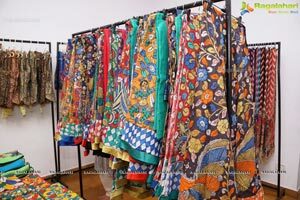 The symmetry of the motifs on the skirts is the attraction of it. 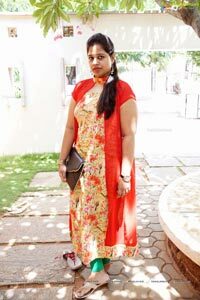 The long skirt with a biiiiggggg flair is one of the exclusive stuff, Sangeeta claimed proudly. 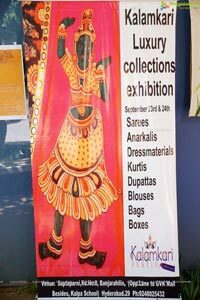 Kalamkari Handpainted Boxes ideal for gifting and preserving valuables another attraction at the exhibition. 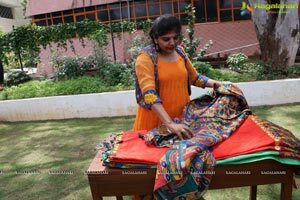 The price range of these sarees include Rs 9000 to 16000, Kurtis from Rs 3500 to 5500/- Last four Kalamkari Festivals were a huge hit. We sell through online as well. We have customers from Australia, America, UK, UAE. 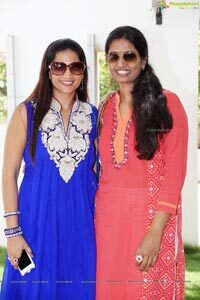 We will expand this festival to Bangalore, Mumbai and Kolkata, Sangeeta informed. 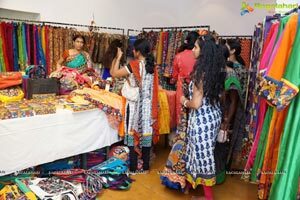 Customers wait for the exhibition. 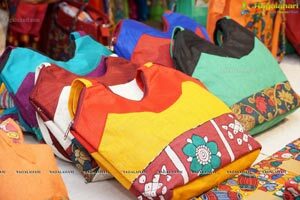 Producing these unique pieces of clothes are 100 artisans, two masters, five tailoring people, four working in dyeing unit and 35 in maggam(looms) units. 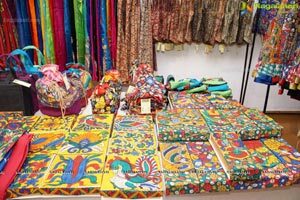 Other plans of Looms include launch of own handmade Indian toys and Games and game books. Today kids are more into gadgets and gizmos. Tinytots are exposed to toxic toys. Kids socail life is stopped. Their social skills are changing. They are becoming hyper. Besides Snake and Ladder, there are no India games exist. I want to use my vast experience in Remedial Instruction to introduce these new products, she said.